3 years after the Fukushima disaster, water contamination is a huge issue that has not been solved. Since the March 2011 meltdown, highly radioactive water has been kept in the tanks, with daily about 400 cubic metres leaking into the Pacific Ocean. Last August 300 tons of untreated radioactive water leaked into the Pacific Ocean. In order to fix the problem, Japanese authorities have come to a radical solution: dumping contaminated water into the ocean with a “controlled release”…starting in May 2014. What does “controlled release” mean? A filtration process would remove radioactive elements from water. However, there are several doubts with the filtration process. There is worldwide no process found yet to filter the extremely dangerous strontium – which will thus be leaked into the ocean. Mismanagement and lack of transparency prevail. 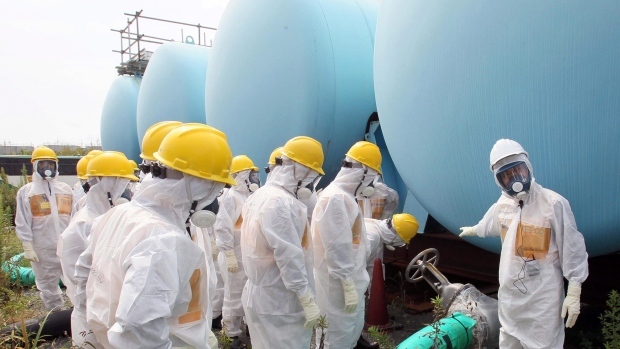 Tepco has only now confirmed what was discovered last September: levels of 5,000,000 becquerels per litre strontium in measurements only 25 meters from the shore – the legal limit for strontium 90 release into the ocean is 30 becquerels per litre. More than 166,000 times the legal limit! I have found it difficult to balance my love of fashion and the industry that surrounds it with activism for our environment. Vivienne Westwood gives me courage every day to fight on.